An invaluable multi-purpose dressing aid for use in the treatment of most conditions and injuries of the skin. POULTEX® can be prepared like a traditional poultice, or take advantage of the less fuss, less mess, and easy to use bag preparation system. Ensure that the temperature of POULTEX® is acceptable to your own skin before applying to that of the patient. Hot and cold extremes can be dangerous. Standard Pack 1 x Size A = 16" x 8"
2 x Size D = 8" x 8"
Use as a dry pressure pad on tissue damage, swellings, sores, rubs or raised calluses at pressure points. If the surface of the wound is extremely dry or cracked, wet the pad first to soften. Apply dry pads for maximum drawing effect. Cleanses and promotes faster complete healing. Reduces swelling and local oedema. Use POULTEX® hot and wet if application is required on to old suppurating or exudating wounds or sores. 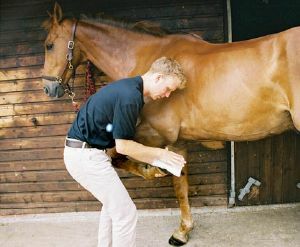 Draws out infected or dirty wounds & abscesses. Aids extraction of thorns and splinters. Stimulates healing blood circulation to affected areas. Reduces bruising, swelling, sprains and strains. Reduces pain from contusions, wrenched or twisted joints, injured tendons and sore shins. May be chilled but do not freeze. Change wet dressing every 8 hours. A wet dressing may be pre-prepared at room temperature and kept in the activator bag and used within 12 hours. Heat or cool appropriately before application. Activator bag in every pack! Measured amount of water leaves POULTEX® unsaturated and free to absorb exudate. The Activator Bag allows you to prepare POULTEX® hygienically, rather than in a bowl or bucket. Easy to apply wherever you need it. Simply hold in place with Rapz Eazy Tear cohesive bandage. |Structure|What makes POULTEX® so effective? POULTEX® has been developed from over fifteen years of pharmaceutical knowledge and dressing design skills. It’s a mouthful to say, but it’s derived from natural plants and is a great gelling agent. When activated with water it draws out pus, dirt, abscesses and infected wounds. It also helps the pad retain more water which increases the pads duration and capacity for activity. When the salt dissolves in the water within the POULTEX® pad it forms a non-sting saline solution. It has cleansing, healing and tissue stimulating properties. This makes up the main absorbent body of the pad and also acts as a protective cushioning layer. It maximizes strength, absorption and fluid retention. This lies beneath the contact layer. It provides strength and makes the pad easier to handle when it’s wet. It absorbs well and holds away pus or infected secretions. It is excellent at enhancing the drawing activity. This is the final layer which prevents leak through of blood or exudates collected, and assists in reducing evaporation to further improve heat or cold retention. Rapz cohesive bandages are highly suitable for most situations. Bandesive (elastic adhesive bandage) is particularly robust and suitable for holding dressings in place. For further peace of mind, W-Tape may be used over the bandage. First of all ensure that all treatment areas have been cleaned thoroughly. A sterile saline solution is a convenient method for flushing clean all wounds. When needing a dry dressing pad POULTEX® is ready to use immediately. Follow the steps below to activate the pad when it is required wet. Choose the appropriate sized POULTEX® pad. Use cooled boiled water and pour the water into the bag to the correct level indicated for your chosen size. For example, when using pad 'D' only fill the bag to the line marked 'D'. Now place the pad into the Activator Bag. Seal bag expelling all the air. Massage the bag to ensure the pad is evenly saturated. 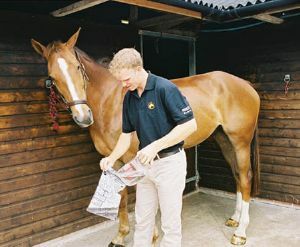 Make sure that the temperature of the pad is acceptable to your own skin before placing it on to your horse’s. Remove pad from the bag and place onto the affected area with the green centre line facing away from the wound. Smooth down firmly and mould to under laying contours. Do not allow the pad to overlap itself and ensure that there are no creases which may form pressure points after bandaging. Never bandage too tightly, especially by over-stretching elasticated bandages. If the bandage is applied too tightly then circulation can be seriously restricted. Always apply any bandage with even tension.